﻿ Suzuki's fuel cell scooter gets mass-production approval - but should you want one? Suzuki's hydrogen-powered Burgman scooter has become the first fuel-cell vehicle to get European Whole Vehicle Type Approval ­- a license to start mass production. Hydrogen power might be a technological cul-de-sac but various governments, including our own, are determined to make it as long a one as Brookside. Hydrogen fuelling stations are being incentivised into existence from London out, and Suzuki looks set to be the first bike manufacturer to make hay. An arm-wrenching ride the 11bhp scoot is not (as we discovered when we rode it last year), but as far as securing Suzuki's future goes, let's just say the high-ups in Hamamatsu are a lot more excited about this than the next Hayabusa. Co-developed with British firm Intelligent Energy, the hydrogen-electric hybrid Burgman is vibrationless, silent and only emits a barely-perceptible breath of water vapour from its tailpipe to confirm something is happening. And what is happening? Hydrogen is being ducted from a high-pressure tank in the scooter's underbelly to a fuel cell stack little bigger than a shoe box under the seat. It isn't being burned; instead an electro-chemical reaction is separating the hydrogen atom's proton and electron -­ like horses from their coach ­- and making them run around an electrical circuit, producing energy. It's happening simultaneously in scores of fuel cells - stacked inside their container like After Eights in a box ­- resulting in an electrical power output of around 2.5KW - or a little over 3bhp. Some of that power is being fed directly to the electric motor attached to the back wheel, some is charging a lithium-ion battery which provides the balance of drive required for accelerating ­- around 11bhp in all. It isn't the stuff of petrolhead dreams, but it's right on the money for a 125-class commuter. Whether or not you're bought-in to a post-petrol future (and most enthusiast motorcyclists aren't) doesn't matter. Whether vehicular emissions are to blame for global warming or not doesn't matter. Even whether hard-to-handle hydrogen is feasible as a widespread replacement for petrol ­- and there are many well-founded reasons why it is might not be -­ doesn't matter either. The decision to legislate old-fashioned combustion-engines out of existence was taken years ago - and whether it was the right decision or not, governments including our own are irrevocably committed to making it right. Against that background, Suzuki's pragmatic approach is very clever. Britain and many other governments have signed up to the International Partnership for the Hydrogen Economy. London has promised to have at least six hydrogen refuelling stations running by the end of the year, and the US has committed over £1bn to make hydrogen more readily available to motorists. 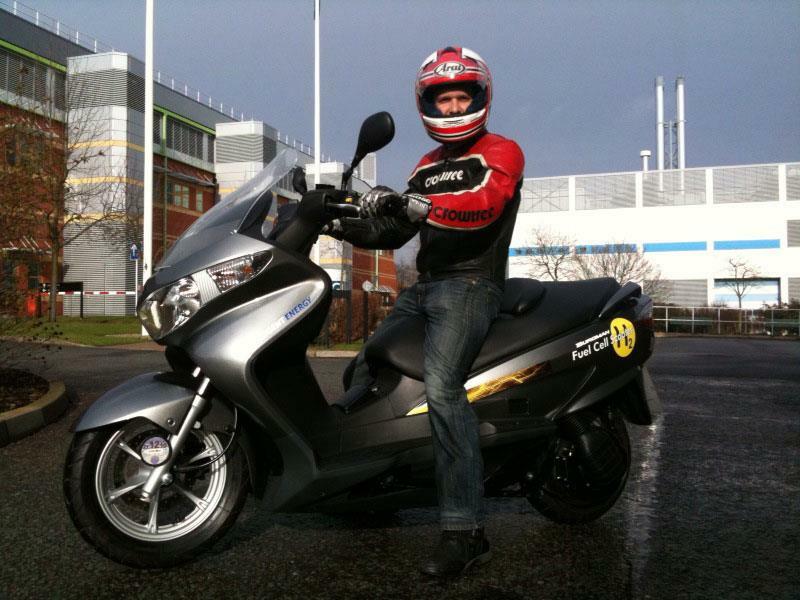 Then there's the competition - all-electric battery-powered machines cresting a wave of hype thanks to TTXGP. The 40-mile range, 8-hour charge time, heavy and expensive batteries of all-electric bikes are a hell of an inconvenience. Suzuki says it made the fuel cell Burgman with the idea that commuters wouldn't have to change their habits at all - and by the time it or something like it hits production (2015 is whispered) that may be true, at least for Londoners. The Burgman powered by an evolution of the lightweight air-cooled fuel cell motor used in 2007's Crosscage concept - but with double the tank pressure and hence capacity (10,000psi containing about 500g of hydrogen gas), built to a design and price that's entirely production feasible. 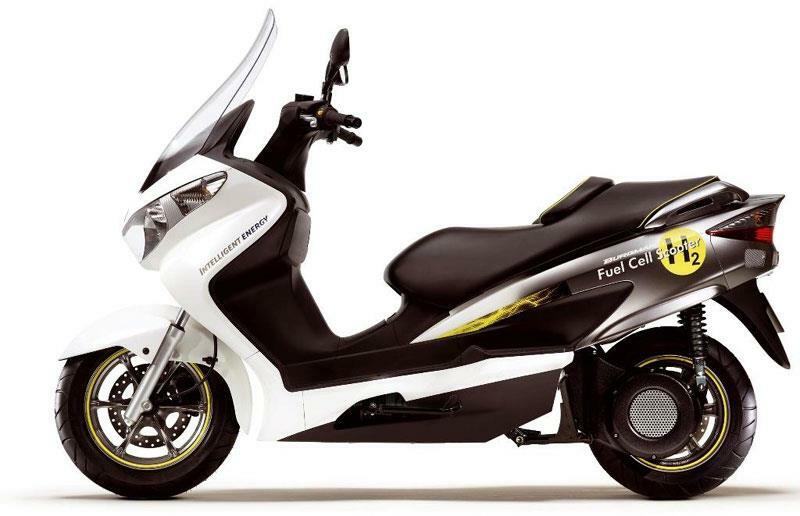 Suzuki says it expects fuel cell bikes to carry a 'small premium' over petrol equivalents when they hit the market. Suzuki is stretching a point when it claims the Burgman could reach Edinburgh on a single fill-up -­ its 220mph claimed range is valid only at a 20mph average -­ but in its natural habitat such as central London, say, where average speeds are a glacial 9.9mph it has a lengthy stride. Even at brisker out-of-town speeds (40mph is about the limit right now) it should clear 100 miles. And the fact it can achieve that range without a huge payload of batteries is a huge plus. The fuel cell Burgman weighs 'about 170kg' says Suzuki ­- not much more than the petrol version, at 148kg dry, does when fully fuelled. The fuel cell starts up in under a second, it has a claimed 99.9% reliability and it's a dream to service -­ the only part that needs attention is its air filter, and there's no clutch or gearbox. It takes five minutes to fill the tank. Hydrogen should - mile for mile - cost no more than petrol to buy when it becomes available, and in fact will likely enjoy a substantial tax advantage. The words 'hydrogen' and 'Hindenburg' are rarely out of each other's company. But its risky reputation is unwarranted says Suzuki. The fuel cell Burgman's gas tank has withstood bullet-attack, fire and high-speed impacts on its way to gaining EU type-approval. Spilled hydrogen disperses rapidly and is harder to ignite after only a few seconds than petrol. Is this the first of a new wave machines that will fill MCN's pages in 2020? Yes and no. Hydrogen may never fulfil the dreams of those who envisage a carbon-free 'hydrogen economy', but it doesn't need to be THE future to have A future. There are likely to be many answers to our 'carbon problem', and hydrogen is already produced in large quantities as an industrial by-product and currently wasted. There are 40 million scooter and commuter sales a year of which Suzuki need only grab a near infinitesimal proportion for it to be worthwhile economically. And it's laying-in experience in a field governments are gold-plating a future for, and which rivals appear to be neglecting. 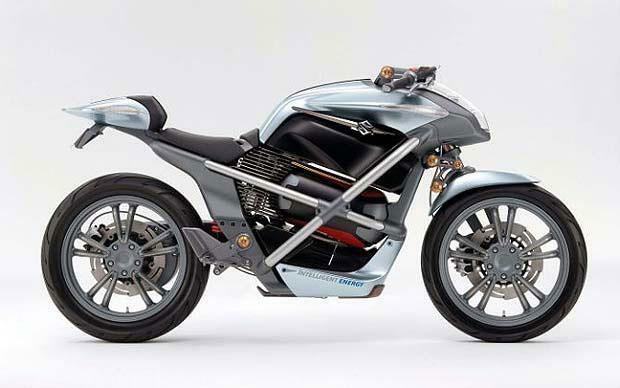 As for a hydrogen-stuffed MCN in 2020, if fuel-cell commuters are the only thing available, it's unlikely there'd be a community of enthusiast bikers for the paper to serve. But neither we nor Suzuki anticipate that. They've simply opened a new front in the war to defend pleasurable personal mobility that is likely to wage for the rest of our riding lives. Big scooters - why would you need anything else?